Just east of Siena, there are beautiful, quieter roads that are wonderful for running. The Chianti Marathon, run every October, has a wonderful one-way route from the Castelo di Brolio to Castelnuovo Berardenga. The driving distance is only 12 km, but this marathon course stretches it out into a particularly scenic route along quiet roads and ‘strade bianche’ (the quiet, unpaved roads throughout the Tuscan countryside). Very pretty run, but hilly — 950m elevation gain with a particularly tough section from km 24.5 to km 28. They also have a 21 km loop, starting and ending in Castelnuovo Berardenga, which has gentler terrain and is less hilly. Any section along either of these partially overlapping routes can make for a wonderful run, highlighting some of the prettiest sections of the Chianti region, including the ‘lunar landscape’ feel of some areas. 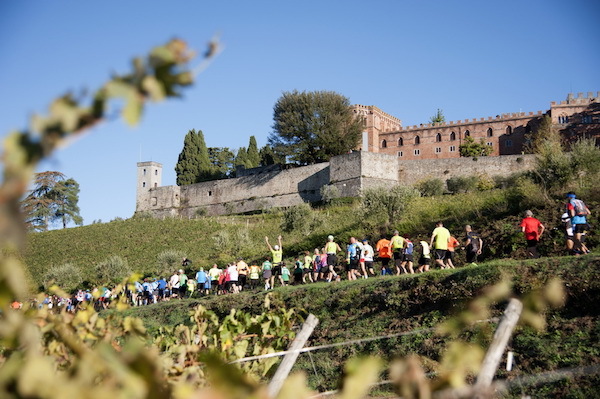 The website of the Chianti Marathon has a detailed description of both courses. Castelnuovo Berardenga is the anchor point. Can also choose any section of route!